It's been a while since I've done a Myth or Monster installment, (Sorry, lovelies. I've been slaying dragons in real life.) so I thought I'd pop in today with a few of my favorite monsters... Loki's Children! Like many Gods in mythology, Loki wasn't particularly discerning about who or what he slept with. As a result, he fathered a handful of frightful children, a few of whom play major roles in the Norse Ragnarok myths. Interestingly enough, Loki is also mama to one of his children. 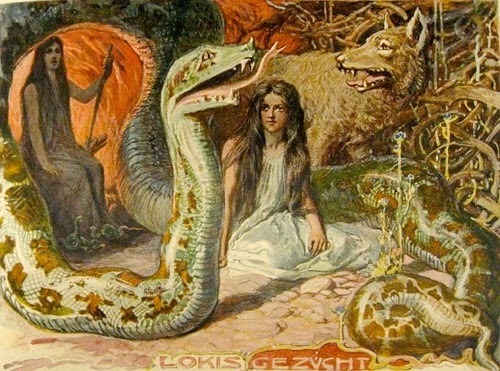 Loki mated with Angrboda, a Jotunn witch, and sired Hel, Fenrir and Jormungandr. These three caused more than a little trouble with the other Gods. Fenrir frightened Odin so badly, he used a magical chain to bind Fenrir in the bowels of the earth, where Fenrir promptly swore vengeance and sets in motion the Ragnarok myth we all know and love. When Fenrir eventually breaks free and Jormungandr releases his tail, death and destruction ensue. Jormungandr and Thor kill one another. Fenrir kills Odin and is then killed by Odin's son Vithar. Hel, of course, rules over the underworld where Odin banished her in an attempt to thwart the prophecies promising nothing but trouble for her and her siblings. During Ragnarok, she's destined to lead an army of the dead, with Loki at the helm, to wreak havoc on the world. Because, why not? Odin kind of set himself up for that one when he tossed her into Niflheim and gave her dominion over the nine worlds... Ever noticed how the Gods tend to be their own worst enemies? It's almost human of them. In addition to these lovely children, Loki also fathered Vali, though we don't hear much about him, save what is relayed in regard to his role in his brother Narfi's demise. With Sigyn, Loki fathered Narfi and Nari, who may or may not be the same person. Narfi was killed by Vali, who was transformed into a wolf. Once dead, the Gods used Narfi's intestines to bind Loki, because why not punish Loki for being a liar by wrapping him in the entrails of his slain child and then turning those bonds into iron? Finally, Loki gave birth to Sleipnir, the eight-legged horse. To accomplish this feat, Loki transformed into a mare and mated with Svaðilfari, the horse owned by the builder killed by Thor when he didn't finish the walls of Asgard as agreed (because Loki intentionally slowed him down by sleeping with his horse). Sleipnir became Odin's steed, and was ridden into Hel for various reasons. Unlike Loki's other children, Sleipnir didn't cause mischief. He was, as promised, the best horse in all the land. I find myself fascinated by the tangled branches of this family tree. Loki's offspring are as twisted in myth as is Loki himself. Had Loki behaved himself, he wouldn't have had many of these children, who wouldn't, in turn, cause mischief and problems of their own, eventually threatening the very survival of the world. And like Loki himself, their relationships with the rest of the Aesir are incredibly complex. It's Sunday dinner with the family... Norse style! In all seriousness, Loki's children are a study in the twisted dichotomy of Norse mythology. Their existence changes things in pretty monumental ways as is seen throughout the stories surrounding the Norse Gods. Their stories are definitely worth a read.